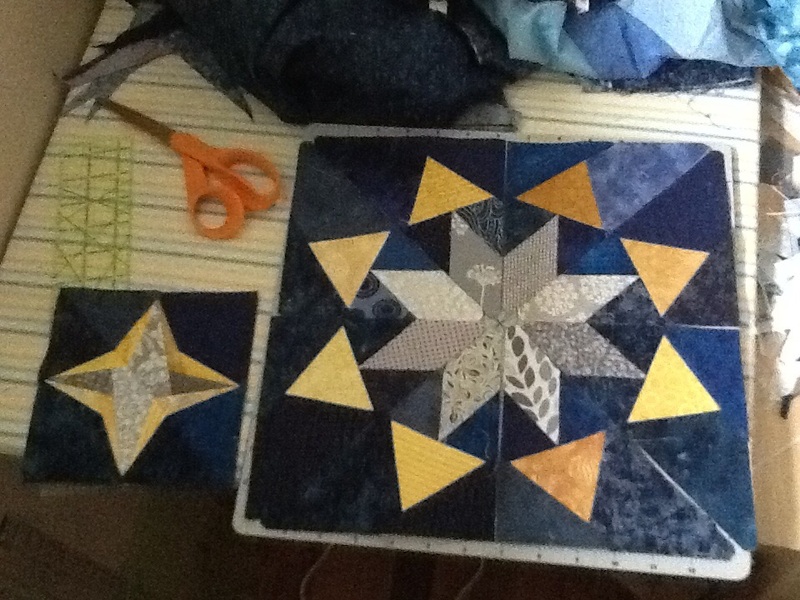 A while back my attention was caught by a project on the Wombat Quilts blog. 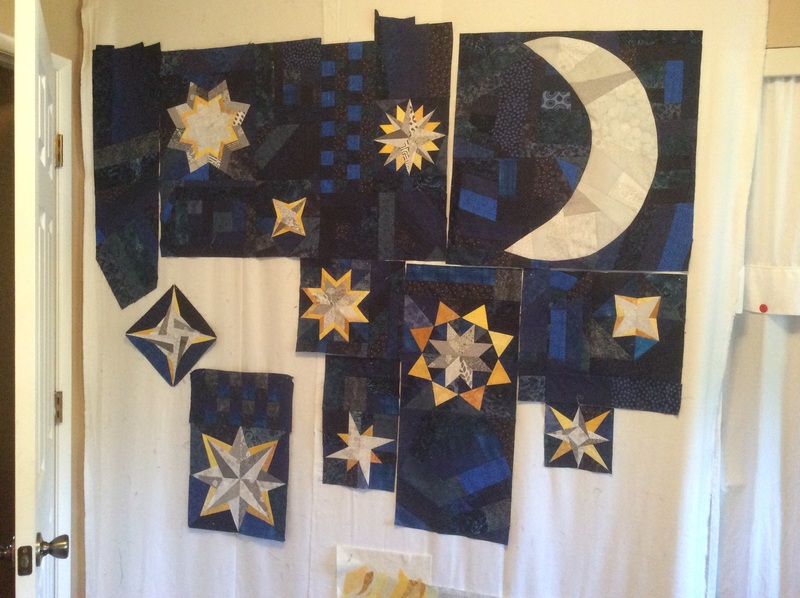 I was exploring paper pieced blocks and she has great patterns for lots of different stars. 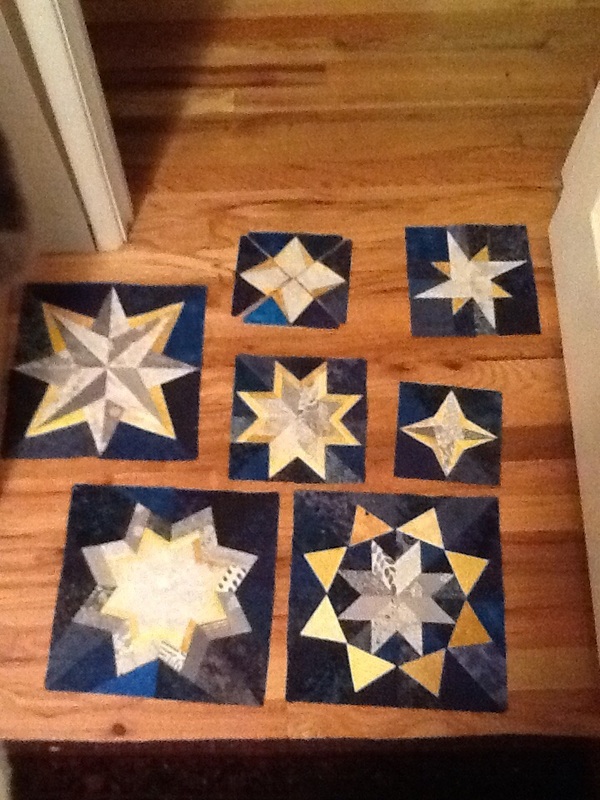 She was making orange and blue star blocks at the time. 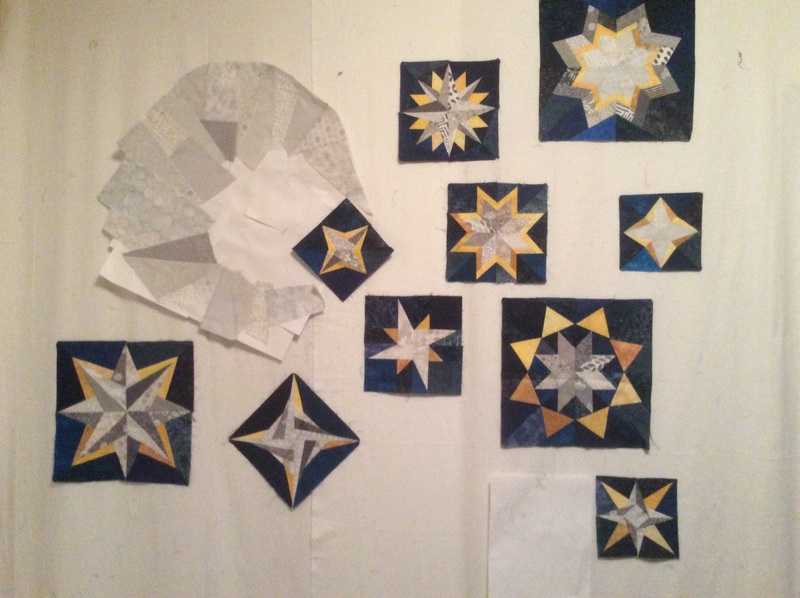 I followed along with some of them, making pretty similar stars, though mine were gray and yellow rather than orange because I love gray and yellow. I kept the dark blue background idea because what other color would a night sky be? And then, as is typical, some other shiny project caught my eye and I moved on. The stack of stars sat on my UFO shelf and waited, gradually moving towards the bottom of the pile. 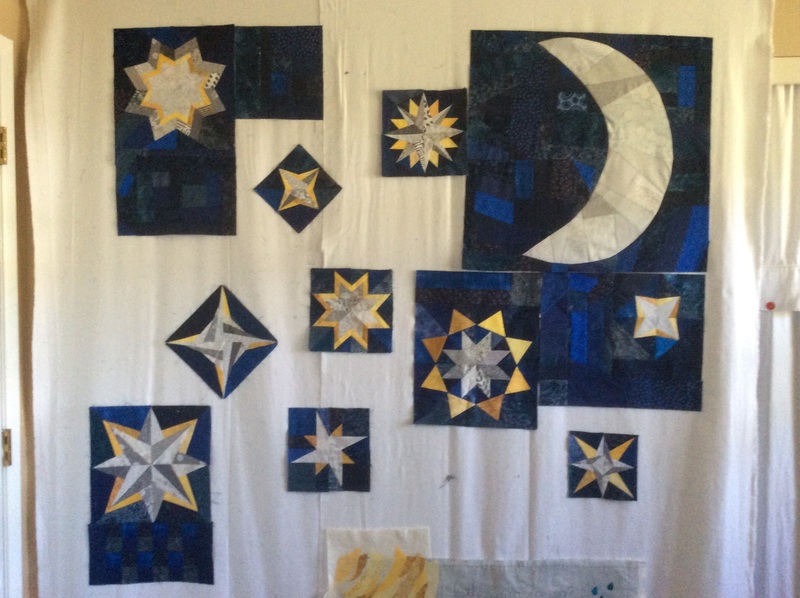 Then I came across this Starry Night quilt on Pinterest, which reminded me of those neglected stars and also solved the problem of not having made enough of them for a full quilt. I just needed hills! And a moon! The moon was a bit of a trial and error process, emphasis on the error part. 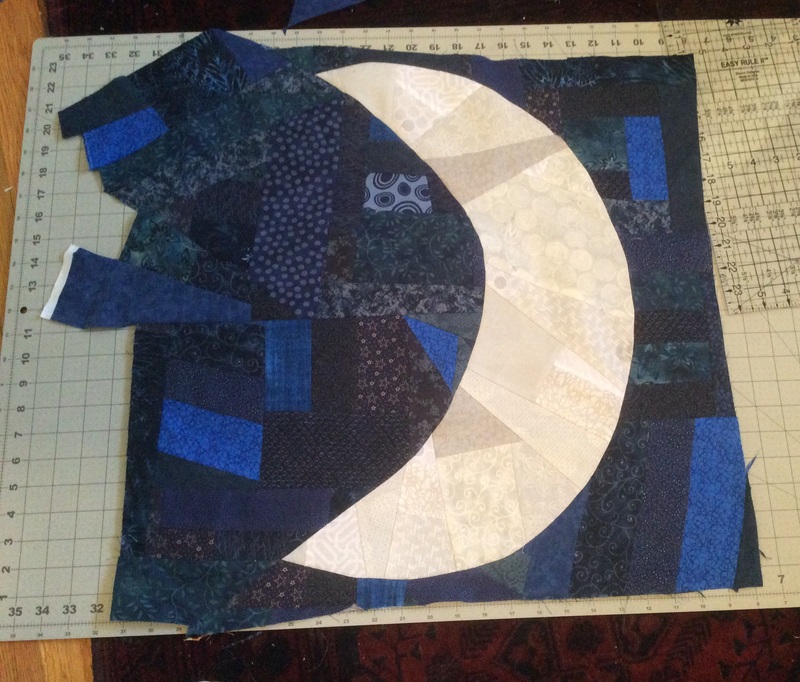 First, with my limited curve skills and a patchwork of printer paper I drew a crescent moon outline to use as a piecing pattern, I made this moon. Then I stared at it for a couple days, pretty much hating it more and more. 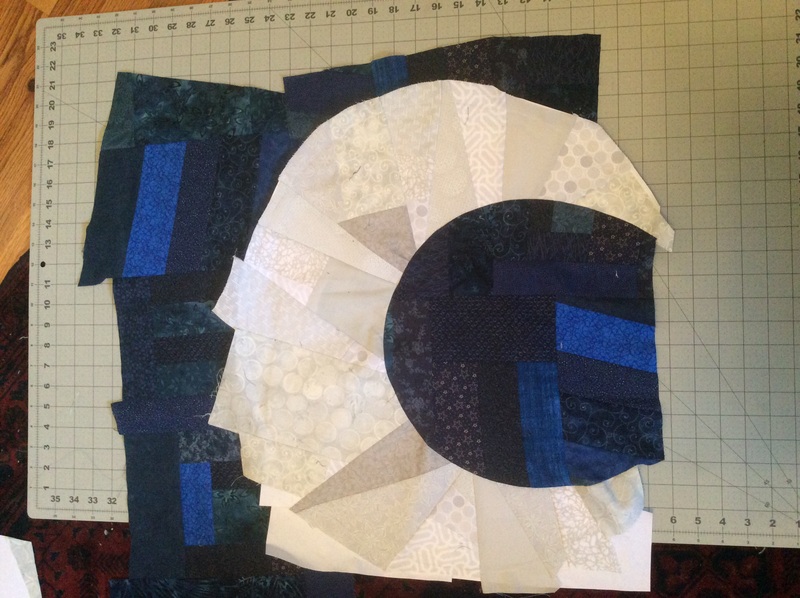 The center circle was too small, the points curved in too much, and then there were the puckered seams. Some slicing was definitely called for. Not perfect, but much improved! Now I’m at the fun stage where I’m just filling in the gaps. Lots of slashing and random switching of directions. 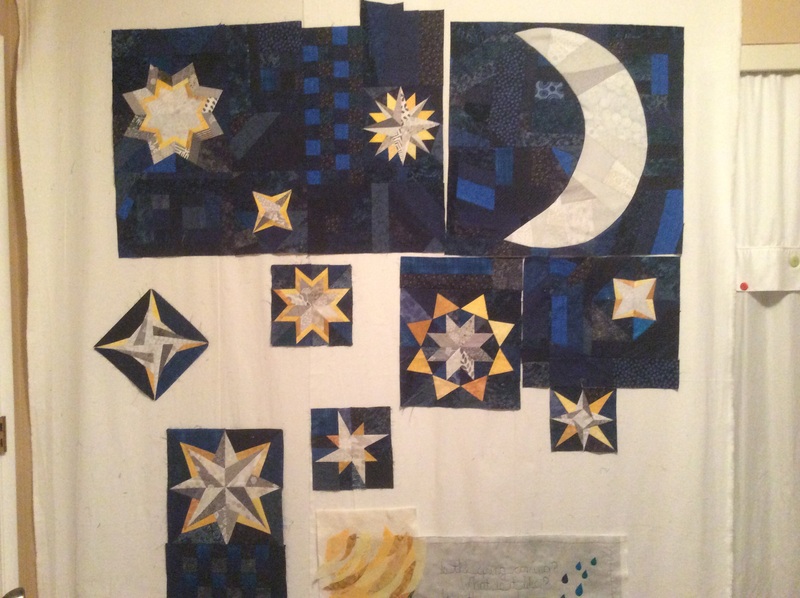 If you look at the original inspiration quilt, she did a lot of paper pieced blocks and has a huge variety of squares. That was never going to happen with mine. So much precision! I never would have finished. 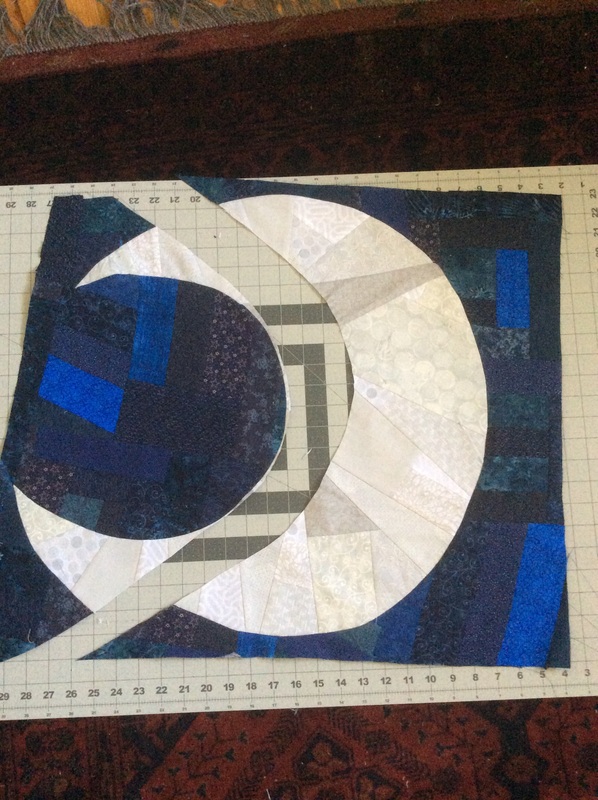 I’m taking a more improv, crazy quilt approach, which is fun, messy, and leads to the occasional weirdly skinny bits of fabric, but it fits the picture in my mind, and I am liking the results. 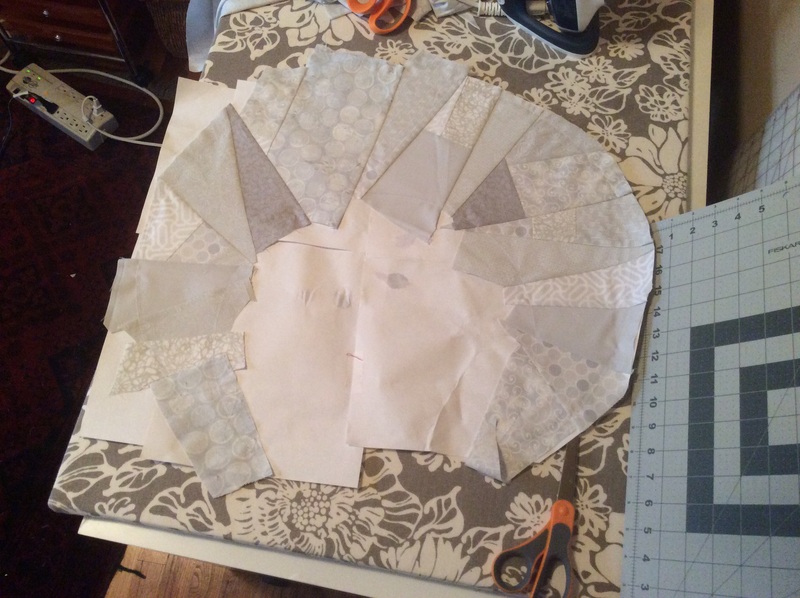 I cut a bunch of strips that vary between 1 1/2 and 3 inches wide, dumped them in a pile to rummage through. 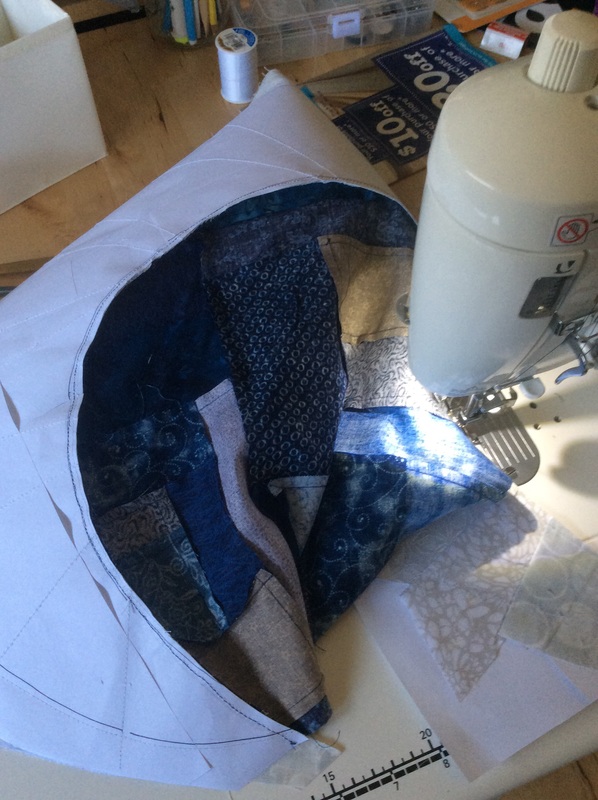 and now I just sit at the machine, sewing and trimming and turning and ironing, and gradually the night sky is turning dark blue. 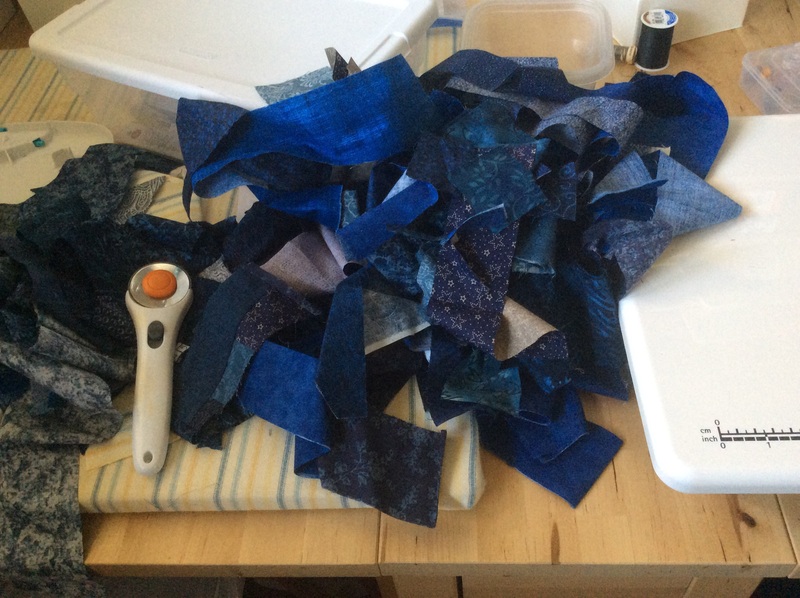 As are my floor, sewing and cutting tables, but hey, creativity can be messy! The hills are going to take a bit of shopping. I don’t have a lot of dark greens. 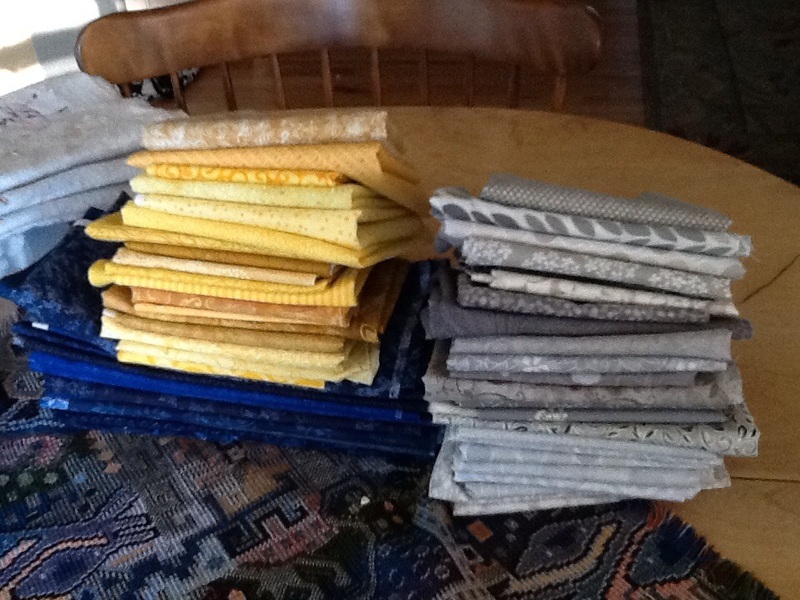 Luckily, I know a few fabric stores in the neighborhood.